Therefore I will boast all the more gladly about my weaknesses, so that Christ’s power may rest on me. I’m happy to report that Bro. Chip Sloam and Martha are home and getting some good rest there. Continue to thank God that Bro. Chip’s brain tumor was not a real problem. Glen Magee, Jr.‘s procedure went well. Glen and Lisa will soon be home. Thank-you for praying for them. A resident of Greenwell Springs, LA passed away on Thursday, August 23, 2018 at Nottingham Regional Rehab Center in Baton Rouge. She was born October 20, 1950 in New Orleans and was 67 years of age. She is survived by 5 sisters, Lilly Bovard and husband, Buddy, Faye Dunlap, Bobbie Confer and husband, Terry, Jan LaBorde and husband, Lance, and Dale Rochel; and numerous nieces and nephews. Preceded in death by parents, Delta Richardson and Albert Ashmore; adopted parents, Oliver and Ann Rogers; 2 sisters, Birdie Ashmore and Annie Beach; 2 brothers, Albert Ashmore and David Aucoin. Pallbearers will be Michael Cardy, Terry Confer, Skip Verdin, John Rufini, William Rufini, and Daniel Rufini. Honorary pallbearers will be Buddy Bovard and Lance Laborde. Visitation at McKneely Funeral Home, Kentwood, from 10 a.m. until religious services at 1 p.m. on Saturday, August 25, 2018. Services conducted by Rev. Donnie Easley. Interment New Zion Cemetery, Kentwood. For an online guestbook, visit http://www.mckneelys.com. Growing up in Clarkston, Ga., every year, Sam Abebe got his backpack full of school supplies from Clarkston International Bible Church (CIBC) through the church’s annual back-to-school event. Today, several years later, Abebe serves as CIBC’s student pastor. Abebe’s parents immigrated to the United States from Ethiopia in search of the opportunity that the nation had to offer, and those backpacks met a need that allowed the church to build a relationship with his family. It took several years—Abebe even moved away from Clarkston for a time—but those gospel conversations had taken root and eventually changed his life. CIBC focuses its ministry on meeting physical needs and helping people find spiritual life through the power of the gospel. Trent DeLoach, pastor of CIBC and a Send Relief missionary with the North American Mission Board (NAMB), leads the church to open pathways of serving the community. On August 3, CIBC once again held its annual back-to-school bash and with the help of Send Relief, NAMB’s mercy ministry arm, gave away over 1,000 backpacks primarily to the international and refugee families in Clarkston. Mission teams from churches across the region helped pack 3,750 backpacks. Backpacks not distributed during the CIBC event were given to schools and to other ministry partners in Clarkston to serve families in need. In New Orleans, another Send Relief missionary, Kay Bennett, also utilizes backpacks as a ministry tool to meet physical and spiritual needs. Bennett has managed the Baptist Friendship House for over 20 years, where she serves and loves the needy and vulnerable in the city. Bennett also hosts a back-to-school party for underprivileged families where she gives away backpacks filled with school supplies to children. With only a month to prepare, Bennett was a little wary about making such a huge leap, but “the Lord always provides” she said after dozens of churches, Woman’s Missionary Union and other partners provided the supplies needed to fill the backpacks. While the back-to-school party for local families was a major avenue for distribution, Bennett also uses backpacks to minister to survivors of human trafficking. That relationship, then, allows Bennett the opportunity to connect those who have been trafficked with a way out, whether that’s through staying at the Baptist Friendship House or returning them home to family. The backpack may be the first step that enables a human trafficking survivor to build a life of his or her own, but it can also be the first glimpse of hope that allows Bennett to point to the life-changing power of the gospel. While Send Relief sends backpacks to its Ministry Centers, the ministry also wants to empower local churches to start similar ministries in their own communities. First Baptist Church Greeneville, Tenn. has served its community through a backpack ministry for several years, partnering with NAMB and Send Relief for the last three years. In previous years, the church visited apartment complexes and served food as they handed out backpacks. This past year, they partnered with local service organizations and hosted an event at the church on July 27. Between three and four hundred people attended, and 42 came to know Christ. Send Relief president David Melber says virtually any church or ministry can use backbacks for ministry for just about any group they are trying to reach. Send Relief has tools available on its website to help any church kickstart a backpack ministry for weekend food programs, back-to-school events, refugees, children in foster care or for human trafficking restoration. Simply click this link or visit www.sendrelief.org/backpacktools for more information. Brandon Elrod is a writer for the North American Mission Board. I learned that the truth of God’s love is better than any fairy tale. My home in a part of the former Soviet Union was cold and dirty. My mother and father drank all the time. They often left me and my sister by ourselves, sleeping on beds with no linens and without food. We did not attend school until I was 8 years old, when my sister and I were placed in our first orphanage. When we were moved to another orphanage, we still had to share everything with everybody there. We wore hand-me-downs and shoes that never quite fit. We didn’t have anything to our name. At the time, we didn’t even know our birth dates or how old we were. I would always read fairy tales to get away from reality. I dreamed of being Cinderella because she went from being a nobody to being a princess. I had gotten my hopes up that my sister and I would be adopted, but at the last minute the woman backed out. I felt undeserving, that I was a nobody. Why would anyone want me? I lost hope. When I was at my lowest point—feeling unloved, worthless—God brought me a shoebox. I was about 9 or 10 years old. It was the first time I had received a gift other than candy at New Year’s. My shoebox was suitable for a princess—it was pink. I loved pink. One of my gifts was a pink pen with feathers and a dangling heart. I had never seen something as fancy as that. I also received a teddy bear. I always had to be the strong one to take care of my younger sister. But when I was by myself, I used to tell all my worries to that teddy bear. 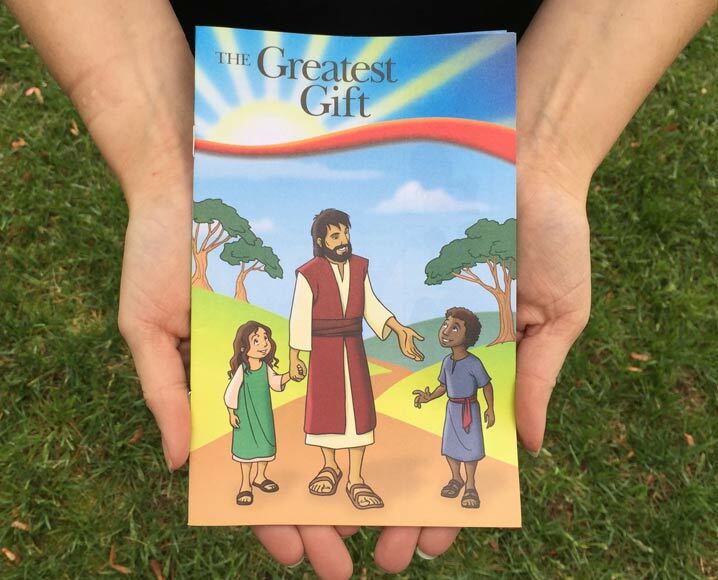 What had the biggest impact on me was “The Greatest Gift” booklet that told of Jesus’ love for me. I had never heard about that kind of love before. I thought it was a fairy tale. The Creator of everything came down and died for someone like me? It gave me hope. I began to pray for a family, and God provided me a family when I was 12. What’s more, God provided a family who wanted to keep me and my sister together. The orphanage kept our old clothes for reuse once our new parents arrived in our country to take us home. When they took us shopping for the first time, I was just so glad to get new shoes that I didn’t care whether they fit or not. So, when my dad removed the first pair of shoes I had tried on at the store, I was upset at first because I thought they had changed their mind. But, in a Cinderella moment, he helped me into another pair, checking that my toes had just the right amount of room to get the perfect fit. My frame of reference for how a father acted wasn’t a happy one. It was an angry one. When people would tell me that God was my Father, it didn’t have the comforting effect that it did for most people. At our new home in the United States, our dad—our adopted father—would hug my sister and me and kiss us on our foreheads each night. Then, he would tell each of us, “Ya tebya lyublyu” (pronounced ya teeb-ya lu-blue), which means I love you in our native language. I had never heard that before. At first, it was strange and scary, but then I started waiting to hear those words each night as it became a tradition of ours. About a year after my sister and I were adopted, I became a Christian. It took a year for me to realize that I didn’t always have to be on my best behavior just to be able to stay and be loved. I was afraid that if I did something my parents didn’t like, they wouldn’t want me anymore. Our parents kept telling my sister and me, there are three main things you need to remember: God loves you. We love you. And, there’s nothing you can ever do to change that. God loves you. We love you. And, there’s nothing you can do to change that. God’s been working through it all. Not only am I part of an earthly family, I’m part of a heavenly family. While studying at Ozark Christian College I helped organize shoebox packing parties so other children would learn of God’s love for them. Now, as a recent graduate, I look forward to continuing to share His love with orphans around the world. Thank-you for reading and praying.